Sand trap is a tank that usually sits underneath the shale shakers. Flow from the shale shakers goes into the sand trap. 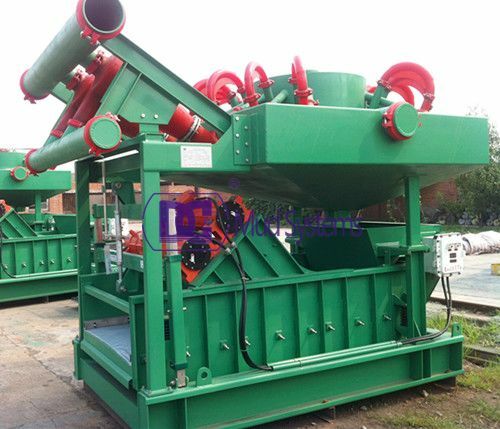 The purpose of the sand trap is to give temporary protection to the rest of the system if a shale shaker screen splits. In this case, the larger solids will settle in the sand trap, and they can be later dumped through a large butterfly valve on the bottom of the sand trap. A hydrocyclon is a simple but ingenious bit of kit no moving parts. It is comprised of a cone with a small hole at the bottom end. At the top of the cone is an inlet pipe, positioned so that mud entering the cone does so in such a way that is swirls around the inside diameter. An outlet pipe exits upwards, but the bottom end of this pipe sticks into the top of the cone. As mud moves round the inside of the cone op, it eventually comes back to the inlet pipe position, where more mud is coming in. This forces the mud stream downwards, into the cone. As the cone gets narrower, the fluid speed has to increase to a ccommodate the flow rate. Very high centrifugal force are exerted on the fluid stream, so the heavier solids particles will move towards the outside of the fluid stream. 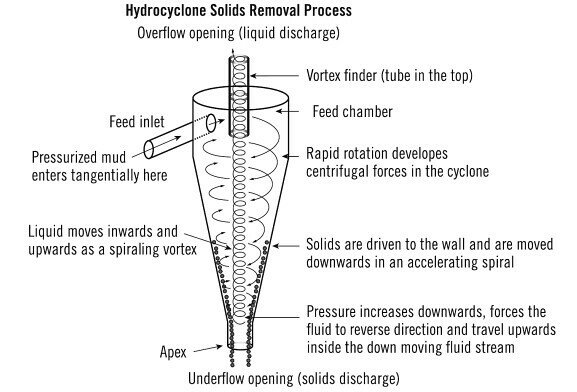 As the fluid stream nears the bottom, pressure builds up to the point where the fluid changes direction and starts back upwards, spiraling up inside the descending mud, which stays close to the cone inside surface. The solids particles, being heavier, cannot change direction so readily and are ejected at the bottom of the cone. The cleaned mud stream exits at the top of the cone, out of the overflow opening. Large cones process larger volumes of mud and remove larger particles. Smaller cones process smaller volumes but can remove finer particles. Most rigs will have a set of 3 or 4 large cones, around 12″ diameter at the top. These are called desanders because they remove particles of sand grain size. Most rigs will also have a set of perhaps 16 or 20 small cones, 4″ diameter at the top. These are called desilters because they remove particles of silt grain size.